NEW BETHLEHEM, Pa. (EYT) – Additional details were released on an altercation at New Bethlehem bar during which a Clarion County man’s throat was slit. State police say 36-year-old Matthew Duane Atcheson of Brookville allegedly slit a New Bethlehem man’s throat early Sunday morning. 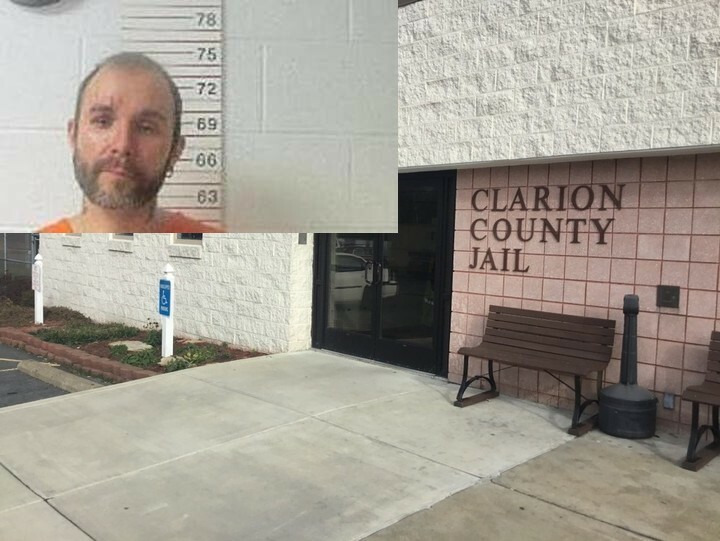 He remains lodged in the Clarion County Jail on $250,000 monetary bail. A preliminary hearing is scheduled for 1:30 p.m. Tuesday, Nov. 13, with Magisterial District Judge Jeffrey C. Miller presiding. According to a criminal complaint, around 12:30 a.m. Sunday, Oct. 28, Trooper Derek Weaver of the Punxsutawney-based state police’s Criminal Investigation Unit was notified of a physical assault, which was possibly going to become a homicide investigation at Desperado’s Bar on Broad Street in New Bethlehem. Weaver was informed that Matthew Atcheson had cut the throat of the victim. Around 1:20 a.m. Sunday, troopers from the Pennsylvania State Police Forensic Services Unit responded to the scene. An excessive amount of blood throughout the bar was observed, and a black and gray handled folding “Buck” knife was seized and entered into evidence. Around 1:30 a.m., a trooper interviewed a known woman at the scene. The witness, who is a bartender of Desperado’s, was working the night of the incident. According to the complaint, the bartender reported that Atcheson had been in the bar several times during the evening beginning at approximately 7 p.m. She stated that due to Atcheson’s behavior, he had been asked to leave several times but continued to return. Atcheson had become argumentative when she refused to serve him. The bartender said Atcheson became involved in a verbal dispute with the victim when he asked him to calm down, and a physical altercation ensued with his wife, therefore, Atcheson was told to leave. She reported that Atcheson returned a short time later and continued to cause problems. She heard Atcheson make the statement: “I’m going to (expletive) stab you,” which was directed toward the victim. According to the complaint, the bartender explained she heard an altercation near the pool table followed by patrons yelling for her to call 9-1-1. She then saw the victim with his hands covering a wound to his neck. Around 2 a.m., Weaver interviewed a second witness. The second witness reported that he arrived at Desperado’s around 10:45 p.m., sat down at the bar and began to talk to the bartender. He related that Atcheson was causing problems within the bar and the bartender told him to leave. Atcheson then got into a verbal altercation with the bartender and other patrons and refused to leave. The second witness stated that Atcheson’s wife then attempted to remove Atcheson from the bar, and they became involved in a physical altercation. Atcheson and his wife then left through the back exit. The second witness reported that Atcheson was kicked out of the bar a total of three times by the bartender before entering a fourth time. The witness reported that Atcheson yelled at the bartender and then removed a knife from his back, left pants pocket. He noted that he noticed the knife in Atcheson’s pocket before Atcheson pulled it out and yelled “knife” to the victim. He reported that there was music playing, and it was hard to hear; however, the victim heard him yell knife and turned to look. According to the complaint, as the victim turned to look, Atcheson pulled the open knife from his back, left pants pocket with his left hand and then used the knife to cut the victim’s throat. The second witness reported immediately observing an excessive amount of blood coming from the victim’s neck and indicated that he ran to assist the victim as Atcheson ran back out of the back exit of the bar. The complaint notes that Weaver viewed video surveillance footage of the incident from within the bar, which confirmed the witness interviews. According to the complaint, the video depicted Atcheson confronting the bartender before pulling an open knife with his left hand from his back, left pants pocket, then raising his hand with the knife toward the victim and going at the victim. The victim is then immediately observed holding his throat with other individuals approaching to aid him. Atcheson was arraigned at 9:15 a.m. on Sunday, Oct. 28, in Miller’s office.